I'm all in with the Hodgepodge this week! And, just in time for Joyce to take a break next week because she's MOOOOOOVING! I swear it doesn't seem like 13 months since they moved from NJ, but I'm sure it does to her and the hubs! 1. Besides your very own house, describe a place where you feel most 'at home'? Church. Honestly. Growing up, mama was the organist, so we were there quite a bit. The building is different now, and it's taken me a while, but I finally feel very much at home there. 2. When did you last 'hit a home run' with something? Explain. Last week was our state organization's convention. At the last minute, I bought 2 raffle tickets for paid registration to a big summer conference that the national organization puts on every year. I've always wanted to go, but haven't due to money and distance. My 2nd raffle ticket was pulled, so I'm going to New Orleans this summer! 3. Tell us about something you love in your house or kitchen that is 'homemade'. My dad made this furniture, as well as our kitchen table & chairs and the boys' captains beds, for us. We always joke & say if it weren't for him, we wouldn't have any furniture! I'm not too picky as far as castles go! I've seen Neuschwanstein, so that can be taken off the list! 5. What's a recent or upcoming plan or project that's required you do a little homework before getting started? Did the homework cause you to abandon your plan or adjust it in some way? OH, GAW! Don't remind me!!! I'm a team member for RCIA (the program that you go through when you want to know more about Catholicism), and my turn is coming up in a couple of weeks. I've got to get serious and get started on my presentation! As a Speech Language Pathologist in a school system, I give my students "homework" every week. It consists of a very short page to practice with their parents. I'm convinced that this helps carry over their skills they learn in the speech room over to the "outside world". I've shared so many memories of the Small Town that I don't want to bore you with the same stories! Just take a look through my posts and you'll see them! I mentioned the state convention earlier. I, along with 3 other Speech Pathologists, had a vendor's booth. 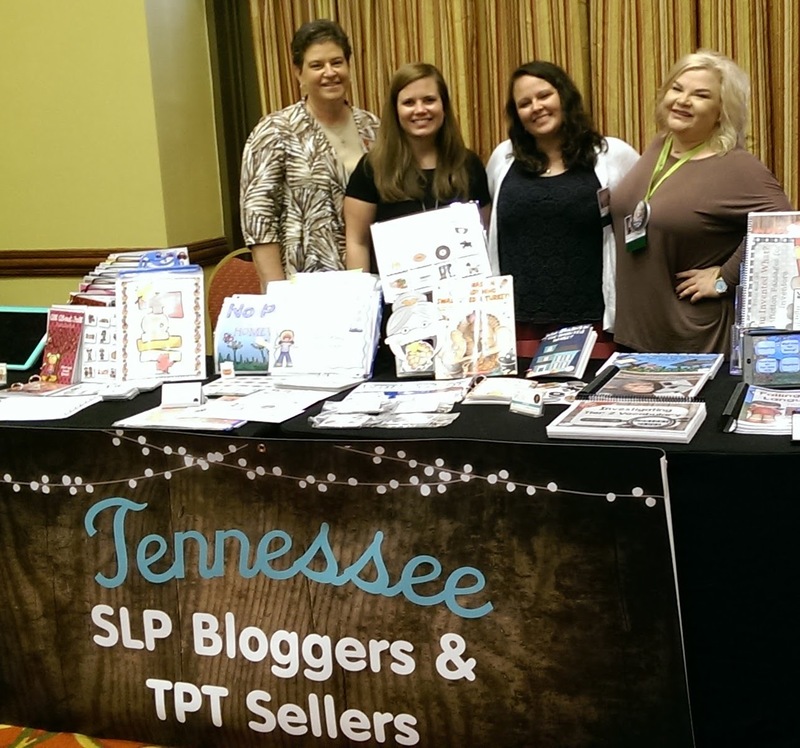 All 4 of us are bloggers and sellers on TpT, where we sell pdfs of materials that we have made to use in speech/language therapy. Only 1 of us knew everybody, but after just a few minutes, it was like we had known each other forever! I think we were the life of the party in the Exhibit Hall! We laughed, we talked, we had such a good time! 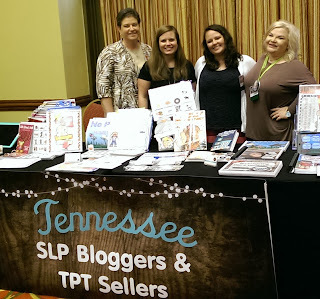 We talked TpT, blogging, and speech/language stuff. These ladies are just fantastic! I agree that the type of homework you give to your students is necessary. But regular teachers sometimes seem to think schoolwork should take up every moment of a child's life just because it works out that way for the teacher (I realize their work is never done!). We home-schooled our children, so everything was "homework", as David points out in his post. My brothers (twins) wouldn't talk when they were little, until they were about 4 years old. Once they started talking, they had trouble with the letter R and blends that including Ls or Rs. Blue became bwue, that sort of thing. This was the case with our youngest son and daughter, too. Our youngest son was talking pretty clearly by 10 months old, but stopped talking when he had ear surgery. When he started back, he had the blending problem. Truck became twuck and sometime something a little more colorful! Our youngest daughter was born talking and had the same issue. He responded well to the speech therapy. She wouldn't cooperate with practicing at home, so it didn't go as well for her. She gets by just fine, though. People think she's from another country and love her "accent". She just doesn't correct them. Our oldest daughter was talking in full, complete sentences well before she was two and was considered to be verbally advanced. She never had the speech issues the younger two did, nor did their older brother. Sorry to ramble on there. I think it is great that you are a speech pathologist and help children get onto the right track with their speech. I know it must take a lot of patience. :) Have a blessed day! That furniture that you daddy made is a wonderful gift and I am sure there are a million memories associated with the pieces. How cool. I have some antique pieces that my father in law refinished so they hold memories as well. Congrats on winning those tickets! That is definitely a win win!!!! Wow! Your dad is a talented carpenter. Beautiful furniture! The furniture is beautiful! What a craftsman! We have a speech pathologist at our school who is phenomenal! I am a huge fan of 'speech people' and have seen first hand the difference y'all make in the lives of children. Everyone at school uses TPT and one teacher quit this year because she makes more selling curriculum there than she did teaching. Go figure. ha! You are so blessed to have furniture made by your father! I have a quilt made by my grandmother that I cherish. Have a great week. Loved the furniture. Your dad had an amazing eye for beauty. New Orleans!! Joe and I love New Orleans! I hope you will have time to do some sight-seeing while you are there! 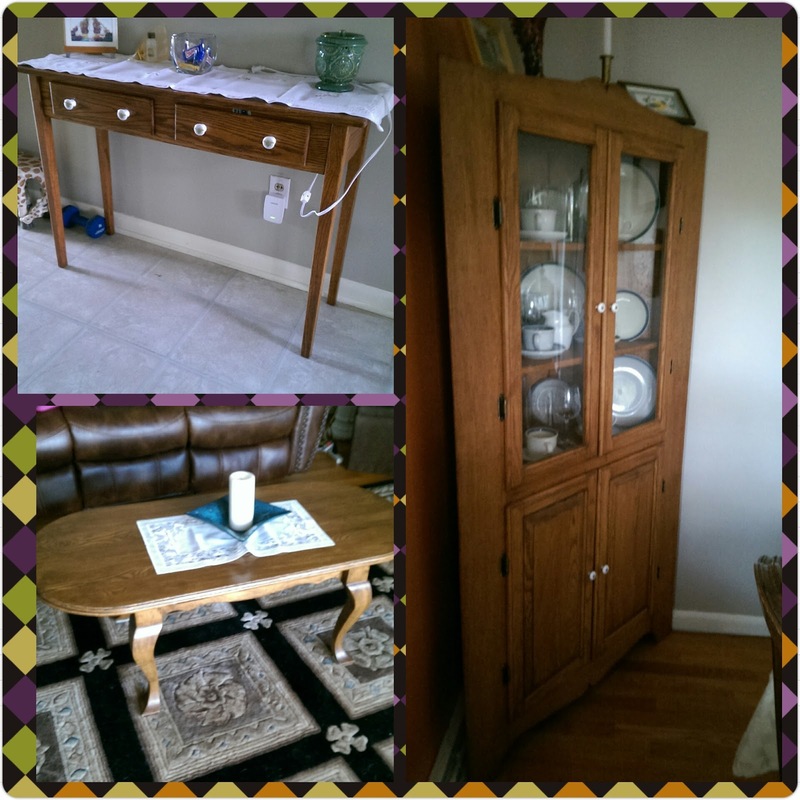 The furniture your dad made is beautiful! What a blessing! It was another fun Hodgepodge! I have always wanted to go to New Orleans! It has always looked like a fun place. The furniture looks great. Your dad is very skilled. Hooray for having your ticket pulled!!! The furniture your dad made is lovely. I do believe that the homework that you send home is definitely an important one. Your Dad made lovely furniture! I enjoyed the photo. Congrats for winning in the raffle!! Good for you! !